The term “digital marketing” is pretty common nowadays and sometimes it intimidate non-IT people. The definition of digital marketing is pretty simple and straightforward; traditional marketing done using web technologies and tools is called digital marketing which is also called online marketing. Even though digital marketing is way different than traditional marketing, the goals of both are the same – boost business, increase sales, increase brand exposure and build a cult around the product etc. Online marketing is getting more and more popularity everyday; interestingly, last year almost every major industry in the world had 4-5% growth and online marketing had more than 40% growth. We are expecting new innovative technologies and strategies in digital marketing this year. Let’s take a look. The world is shifting to digital solutions; B2B, B2C and C2C all business models are moving towards full automation and rapid growth. 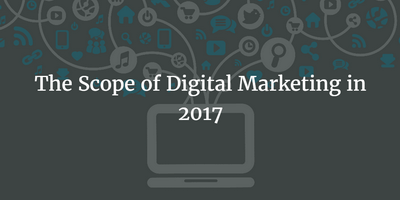 Following are some actionable areas where business can put some efforts and perform digital marketing in 2017. Content marketing has been getting lots of attention for last couple of years and its importance is not going to fade anytime in the future. The main reason contents are important for the success of a website is their direct correlation with user experience. Interestingly, search engines like Google, Yahoo and Bing are now smarter than ever and they can distinguish between fluff and valuable contents. In order to get high ranking in SERPs and get lots of organic traffic, businesses must focus on their content marketing strategies. Few years ago, mobile marketing referred to optimizing websites for mobile devices like phones and tablets which is still important but now mobile marketing also includes mobile app development. Even small businesses all over the globe are using mobile apps to deliver contents in better ways. It is unreasonable to compare a mobile app with mobile version of a website. That’s no brainer; SMM (Social Media Marketing) can help businesses get organic traffic from social websites like Facebook, Twitter and others. The best thing about social networks is their cost efficiency as businesses can use social media for free and increase their brand exposure without spending a hefty sum of money on advertisement and marketing. Also, businesses can run highly targeted paid marketing campaigns to reach out to their target audience based on their demographical traits like age, gender, location and other. Digital marketing is not just about finding innovative and cost efficient ways to advertise products and service on the internet but it also refers to improving user experience for existing customers. Improving user experience could be used as a synonym for CRO (Conversion Rate Optimization) where businesses improve their contents and method of contents delivery to increase sales. In the next post we would talk about some smart and innovative ways to increase business sales and improve brand image.